In the science fiction graphic novel Nausicaä of the Valley of the Wind, most of the world is covered with a highly toxic forest of bizarre gigantic fungi. The artist, Hayao Miyazaki, visualized this forest as a beautiful place with towering forms that look like microscopic fungi made enormous. 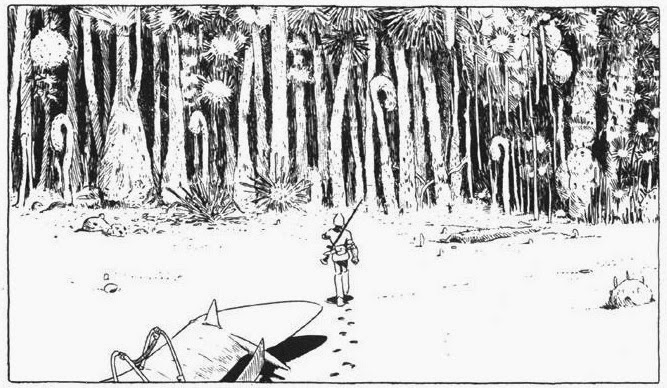 The scenes set in the forest are the most stunning images in a manga full of arresting artwork. I was reminded of these forest images when I saw Garden Object by the team of Rosario Hurtado and Roberto Feo, who call their design studio El Ultimo Grito. The artists call Garden Object a combination between an English garden and The Garden of Earthly Delights by Hieronymus Bosch. 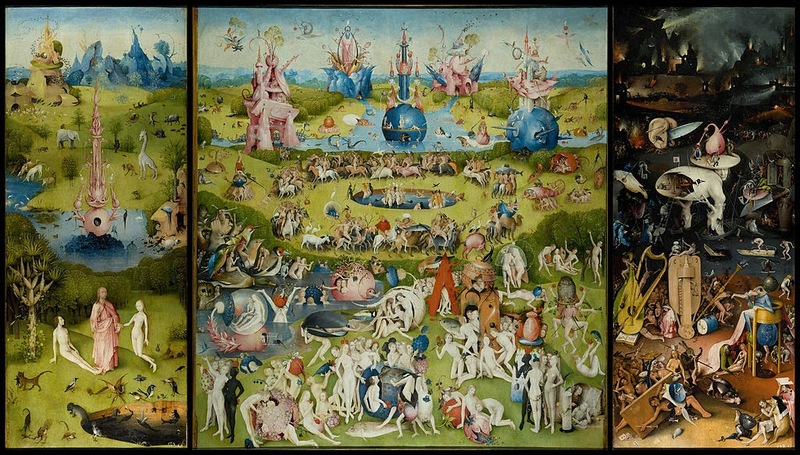 The colors of the installation were chosen from The Garden of Earthly Delights. I can see the idea of a creating a bizarre environment or setting like the Bosch painting, but Garden Object differs in a fundamental way from its inspiration. El Ultimo Grito have created towering tree-like structures. Viewers find themselves in a forest-like environment, which is why I thought of Nausicäa of the Valley of the Wind. But the first two panels of The Garden of Earthy Delights is set on a lawn more than a forest. Garden Object encases the viewer from the top. It's not quite a forest canopy, but the structures do tower over the viewers. The colorful patterns on each of the stalks were made with circular stickers, custom printed for this show. Each sticker has parallel bands of color. Despite the highly geometric pattern that is obviously mass-produced, when the stickers are affixed on an irregular surface overlapping one another, with random orientations, they start to look almost organic. The intense color mitigates this. And the funny thing about the stickers is that while from a distance they create a semi-random pattern and seem like elements of pure color, when you look closely at them, each one contains a signature of sorts--a line of text that reads "EL ULTIMO GRITO @ RICE GALLERY 2014." The use of stickers is interesting and ironic. Their work often involves working in public places. When I think of stickers in public places, I think of visual pollution as people ranging from street artists to marketers cover every flat surface capable of being stuck to with crap, while shop owners and municipal workers perpetually labor to scrape them off. El Ultimo Grito take what is a minor street nuisance and turn it into an integral part of their public artwork. Several of the stalks are topped with circular forms containing video screens. The images on the screens are hummingbirds, which gives this artificial garden a little movement. There is a room off the main gallery which is used for a small fountain. Earlier work along these lines has been sited in outdoor public spaces. These structures are, in essence, elaborate park benches. They are meant to be sat upon, not just looked at. At the Rice Gallery opening, many of the viewers tried out this functional aspect of the work. But there is something fundamentally different about this work in a gallery and the same work if it had been placed, say, outside Brochstein Pavilion. In Rice Gallery, this is an art object only. 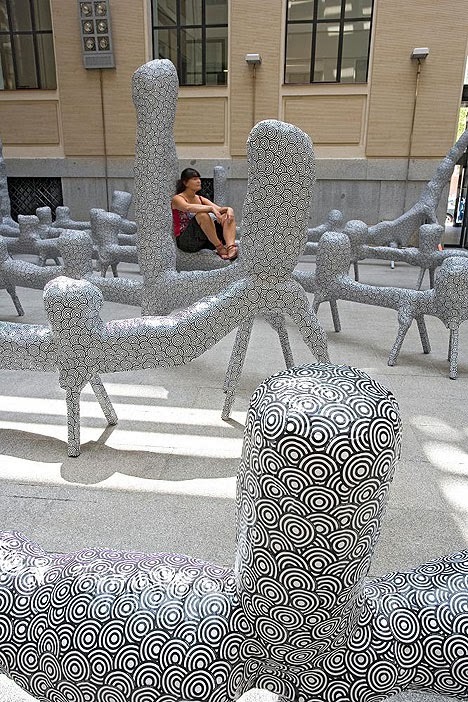 The relationship it has with its viewers is more specific and controlled than the relationship it would have as a functional piece of public art. For one thing, most of the people who see it in the gallery are people who are seeking it out--who want to see art qua art. If it had been placed outside in a quad, the interactions would have been less controlled and aestheticized. 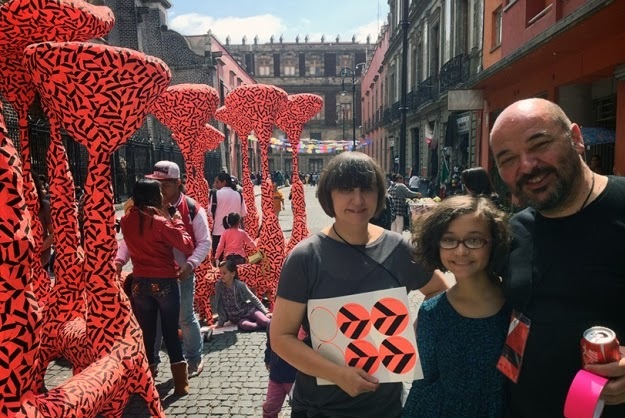 Consequently, it is puzzling to me that it is not very different from their genuinely public pieces, such as the very similar public installation they built in Mexico City recently. What they lose by bringing it into a gallery is the broad social engagement that a more public piece has. But what they gain, as installation artists, is the ability to fully use the gallery. But they passed on that. This seems like a lost opportunity. After all, they could have put their sticker patterns on the floor, the walls, the ceiling. I hate to say what an artist should have done because they're the artists, not me. But I will. To make this installation a true environment rather than a sculpture in a grey cube, they should have done something to the floor and walls. Think for example of Gunilla Klingberg's floor and window stickers for Wheel of Everyday Life. Or Wayne White's painted floor and walls for Big Lectric Fan to Keep Me Cool While I Sleep. And there are many other examples of artists using the floors and walls in the history of this gallery. Garden Object is beautiful and eye-catching, though. It seems ungenerous for me to fault it for not being exactly what I would have liked it to be. Despite my peevish complaints, it's worth going to see, and to sit on. With your delightful description, there is no need to be apologetic.